It is unimaginable already to think of what the Nazis did to the men and women they disliked during the Holocaust, but it is even more inconceivable to realize what they did to the poor innocent children that were "inferior". In 1944, Alfred Rosenberg, Reich Minister for the Eastern Occupied Territories, ordered and action by the name of "Heuaktion"(Hay Action). It resulted in the kidnappings of over 40,000 Polish children that were sent to Auschwitz and then used as slave laborers for the Germans. Raoul Wallenberg was a Swedish diplomat that saved the lives of an estimated 200,000 Jews from Budapest. 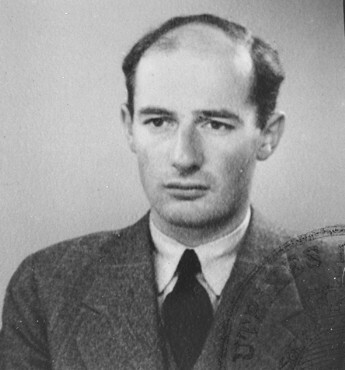 With the support of the World Jewish Congress and the American War Refugee Board, the Swedish Foreign Ministry sent Wallenberg to Hungary in 1944. He there issued thousands of protective documents, secured the release of Jews from deportation trains, death march convoys, labor service brigades, and established the International Ghetto, a network of 31 protected houses in the capital. A true hero, he was unfortuanately detained by Soviet troops on January 17, 1945 and never heard from again. The fate of this diplomat remains a mystery to this day. Himmler Orders Destruction of Crematories! The Nazis were adamantly fixed to the belief that they were correct, patriotic, and proud in the atrocities they were comitting. Interestingly enough, as the Soviets approached and they realized the end was near, the beasts suddenly rushed to destroy all traces of horrid deeds they had done. On November 25, 1944, Heinrich Himmler ordered his SS soldiers to burn crematories at Auschwitz. 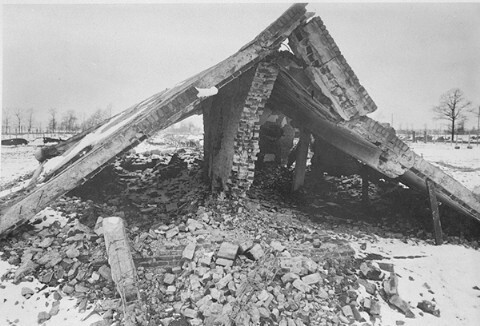 Crematory II, shown at left, was destroyed with crematory III by the SS using explosives. Inmates had ruined crematory IV, while crematory V was blown up as well.